Brighten up any day with a beautiful bouquet from our pick-your-own flower garden. We offer a wide variety of blooms from July thru September. Our flowers are thoughtfully chosen for their uniqueness and beauty. All of our flowers are grown organically. Flowers are sold by the pound ($15/lb). Some varieties, such as dahlias and sunflowers, are sold by the stem. Directions on cutting and scissors are available to use, just stop by our farm stand to get directors and set up on PYO flowers. We do offer Flowers as a Summer CSA and Fall CSA add-on. Information on price and duration of weeks can be found on our CSA page. When you come to the farm to pick up your weekly CSA produce share, stroll thru our cut flower garden and pick a beautiful bouquet to add to your table each week. Please call ahead to discuss availability and pricing. Ask for Mikaela. 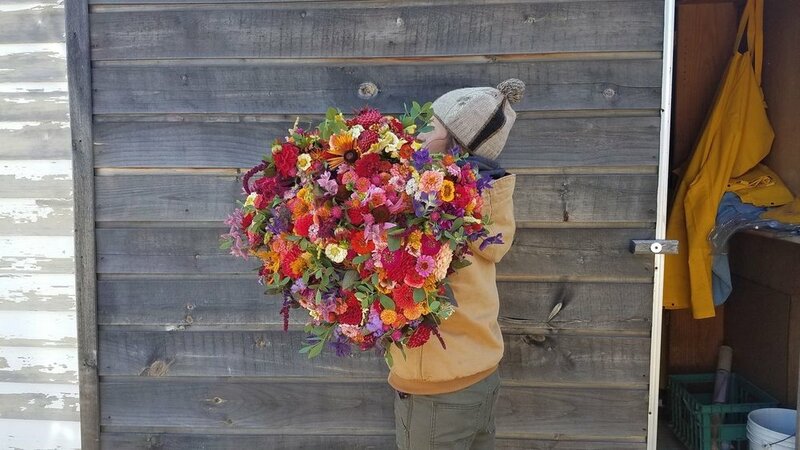 Bouquets are made fresh every few days and available in our farm stand for those who would prefer not to pick their own flowers. We offer PYO blueberries starting mid July when the blueberries start ripening for about 6 weeks and welcome visitors to come pick a pint or buckets full. Stop by the farm-stand for details and then follow signs out to the blueberry patch to pick. We have picking buckets although welcome customers to bring their own. When Tim started Meadowstone Farm in 2004, he had a vision of PYO blueberries and Compost. As you will see when you come visit us, we offer an abundance of other things as well. We offer free of charge, self-guided tours of the farm between 8-5:30 everyday. In the front parking lot you'll find a kiosk with a farm map and throughout your walk around the farm there are informational posts about our organized chaos. Please remember that we are a working farm so keep an eye out for and stay away from and off tractors, trucks and machinery. Also, all electric fences are on and no one is allowed in buildings, greenhouses, gardens without a Meadowstone Farm employee. We love having school groups and organizations of all ages come and visit the farm. We cater the tour to the needs of the group whether they are a ragtag bunch of 3 year olds from a nursery school or a more mature garden group looking for secret compost recipes. Most of the farmers have been teachers in past lives so we can also create specific lesson plans to fit student interests and topics. As always, we can put any group to work. Tours up to one hour are free of charge; additional time is $30.00 hour or donated labor by the group. We also, season and time permitting, can bring our soapbox on the road to visit your classroom or organization. Please contact us in advance if you're interested in visiting.